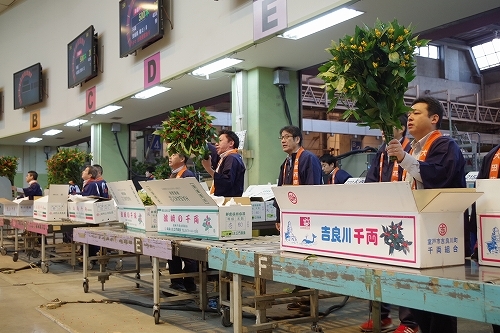 A special auction for “Senryo”(Sarcandra glabra), ”Kokematsu(pine with moss)” and ”Kokeume(prunus with moss)” of this year was held on December 17 Sunday at 7:00 am. Those items are indispensible for decorations of celebrating the New Year in Japan. Regarding “Senryo” this year, the condition of fruit and the volume is better than in past years. But, like a cut pine tree, it has been influenced by 2 consecutive typhoons in the end of October. So, leaves of Senryo from some farms have got salt damage, and each grower had a hard time for cultivation and carefully selected good quality Senryo for shipment. Regarding “Kokematsu”, damaged from insects on leaves, the number of items in good volume is decreasing recently but we could collect easy-to-use “Sanko-harigoke” from Mr. Hasegawa, Mr. Sunouchi and Mr. Shioiri, who are excellent pine growers. 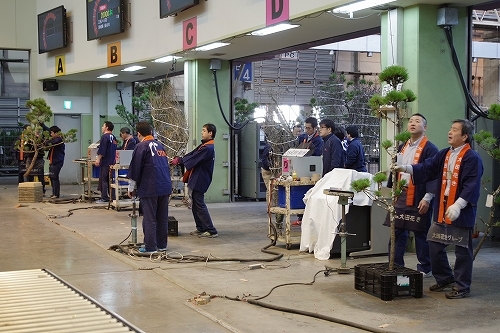 Regarding “Kokeume”, Mr. Hiroyuki Suzuki and Green Tec Corporation carefully selected and shipped good items with blooming prunus. Cyclamens are now in season!